Recently one of the members of the Midnight Music Community (MMC) – teacher Brigitte Louise Lessard from Québec, Canada – shared a halloween music technology lesson she has had much success with in her elementary classes. 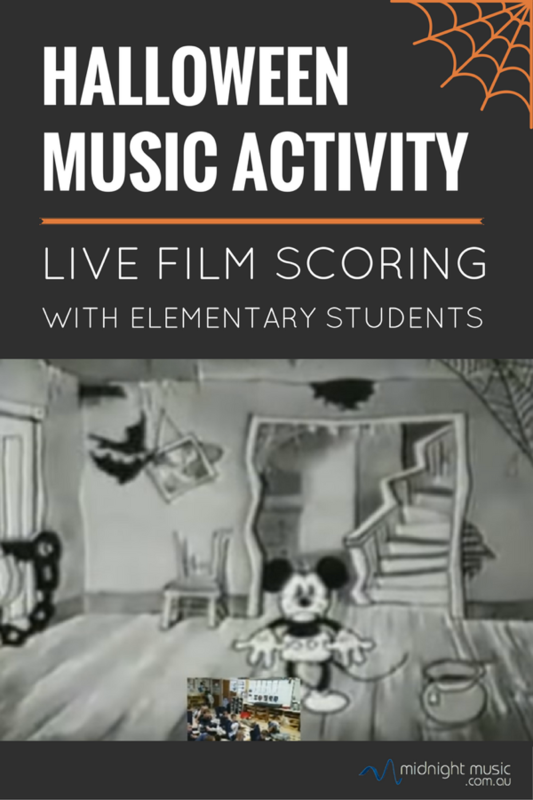 It’s a film scoring activity, but rather than have the students compose a score and match it up to the video in a digital audio workstation like GarageBand or Mixcraft, she has the students perform the music live, along with the film while it’s being shown on a data projector. She video-records the performance and then matches it up with the original video. The project reminds me of the way pianists would improvise music to accompany silent films in the 1920s. Silent film accompanists would either improvise music from scratch, use a compilation of existing (often well-known) classical and theatre music themes, or they would use a combination of the both. Sometimes original music was composed especially for the movie, but that was not a common practice until the “talkies” came along in the 1930s. If you’re interested in discussing the history and techniques of accompanying silent films, there are some great resources online. The Silent Film Sound And Music Archive has example cue sheets and directions for accompanists which are fascinating. 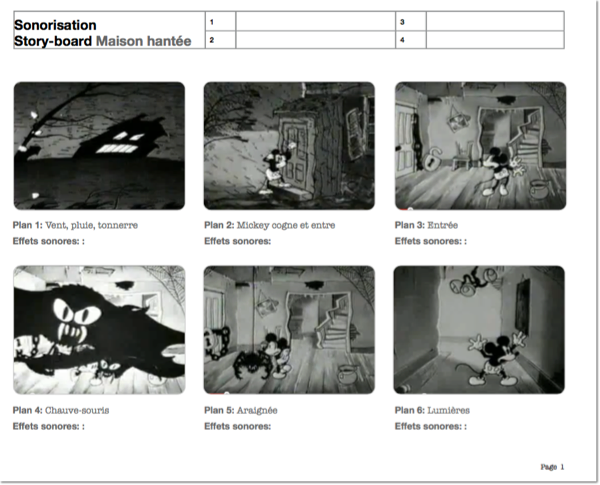 In Brigitte-Louise’s lesson, she takes a classic Mickey Mouse cartoon from 1929 – the Haunted House – and divides it up into smaller portions. She then assigns each section (around 90-120 seconds each) to a different class and they each compose sound effects and music to accompany their portion of the cartoon. To help make the process a smooth one, she creates a storyboard to go with each section of the the video which is used to keep the class on track during the composition process. The video is shown to the students and they brainstorm what type of music should accompany the scene and which instruments to use. They use a combination of untuned percussion, melodic instruments and vocal/body sounds. She finds it easier to compose the soundtrack as a full-class activity, rather than split up into smaller student groups. Brigitte-Louise says the students practice without instruments along with the video – which she displays on the interactive whiteboard. Once the students’ reflexes are good and they are able to match the timing of their sound effects and music with the visuals of the film, they pick up the instruments and play their soundtrack again while she records the student performance with her iPhone. The final step is to create”montage” of the two videos – the original film and the student performance – in a “picture in picture” style. Brigitte-Louise has done the same activity with other short films including the Laurel and Hardy clip and Wall E trailer below. Detailed tutorials, downloadable resources and tips for film scoring can be found inside the Midnight Music Community – the online learning space for music teachers who want simple solutions for using technology meaningfully in their lessons. One reader – Tony – kindly created a blank storyboard for this activity and has shared it with everyone. You can download a copy of the storyboard here. Thanks Tony! This is awesome! There is so much to be learned about sound, notating, film history, working together. I think our classroom teachers would enjoy seeing this happen with their classes and I plan to get our technology teacher involved. Yes so true Sandra. There are lots of cross-curricular opportunities for this activity. I particularly love the team work aspect of it – everyone HAS to work together to make it sound good! I can’t wait to try this with my 5th graders!! How do you create the montage “picture in picture”? Hi Jennifer – you can create the picture-in-picture effect with any video editing software. Basically, you drag both videos into the software timeline and just resize and reposition them until you’re happy with the way they look on the screen. So one is at full-screen size (like the Mickey cartoon) and the other one is small, positioned over the top of the Mickey cartoon (the students). Brigitte-Louise uses Camtasia for that. I use Screenflow on my Mac, but other video editing software will do the same thing. Hope that helps! Great project idea, thank you! If anybody is interested, I have created a storyboard where the kids can identify the sound required and how they will create it. Wow – thanks for sharing Tony! Tony, by chance do you still have that storyboard? Thanks!! Is there anyway I could get a copy of this storyboard you created? Thank you!!! Any chance of you emailing this? The link is no longer supported. I teach music in French and English and would LOVE the template that Brigitte -Louise made, especially as it’s in French! Is there a way to connect me with the teacher by email so that I could ask for the story board she used. Merci! This is fantastic! Where can I download the original cartoon? I’ve done something similar for halloween, though I allowed my students to work independently in small groups (whole group might have had more consistent quality, I’ll admit). We scored short clips from old black and white horror movies: Tarantula, Wolfman vs. Frankenstein, Godzilla, King Kong. They were instructed to both create sound effects wherever necessary, and create something to set the mood. They gave each other scores based on a rubric, as did I, and we announced a winner after the live performances. And then played them the “run out scene” from “The Blob.” First with the original soundtrack, then with the beginning of “Night on Bald Mountain” and finally with “Galop” from the Comedians. The last one is particularly effective because the video goes from creepy, to seeming like a comedy, just due to the music. I am SO EXCITED to teach this to my classes this October! I love how I can differentiate it for the concepts taught at different grade levels, too. Thanks to those who shared the storyboards and their additional resources/ideas!